Mars-Chroniken - Curiosity findet den Nachweis über den Verlust eines Großteils der ursprünglichen Atmosphäre des Mars. UFO-Forschung - Astrophysiker Neil deGrasse Tyson: Ist der Mensch zu dumm für Kontakt mit Alien´s? NASA's communications experts have begun flight testing a prototype radio as part of the agency's contributions toward fully integrating civil and commercial Unmanned Aircraft Systems (UAS) into the National Airspace System (NAS). This particular radio is one of the first steps to provide the critical communications link for UAS pilots on the ground to safely and securely operate their remotely piloted vehicles in flight even though they are many miles – if not continents or oceans – apart. "So far the tests are going well and we're learning a lot about how this prototype radio operates under various conditions, but we still have much more testing to do on this radio and others that will come," said Jim Griner, a project engineer at NASA's Glenn Research Center in Cleveland. Currently there is not a great deal of freedom for civilian uses of UAS over our nation's skies. Police and firefighters, for example, must use off-the-shelf systems and fly under special Federal Aviation Administration (FAA) approvals that restrict where and when remotely piloted vehicles can fly. "There are some pretty good limitations on those operations, but the work we're doing to develop a new command and control radio for the UAS to use will help go beyond that," Griner said. Built under a cooperative agreement between NASA and Rockwell Collins in Iowa, the current prototype radio is a platform to test operations at certain frequencies with specific radio waveforms that are unique to its particular task – in this case command and control of a remotely piloted vehicle. Once testing concludes on the initial prototype, lessons learned will be applied to a second generation test radio, which is now scheduled to be delivered to NASA in September. Additional testing will follow, after which a final prototype design is to be delivered and tested in the 2015-2016 timeframe. Ultimately the FAA will define the final requirements that will lead to certification of a UAS command and control radio for use in the NAS, but by building and testing prototype units now NASA is helping move the process along. "Usually the requirements are defined first and then we try to build equipment based on those requirements. This short-circuits a number of years off the traditional process," Griner said. The prototype radio was delivered to NASA Glenn on Feb. 28 and successfully put through its paces on a laboratory test bench. 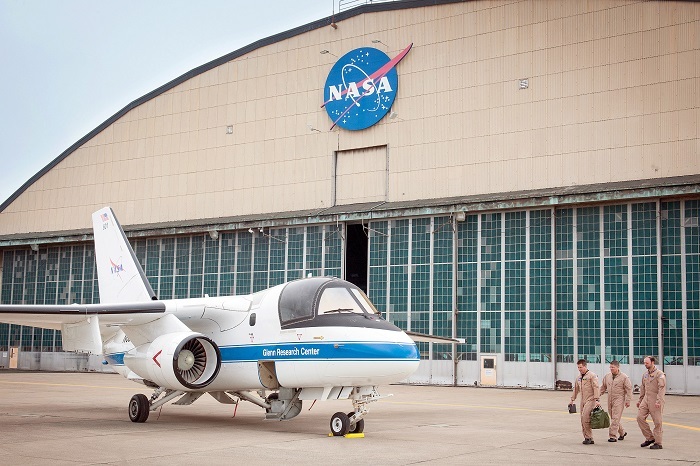 Flight tests in a NASA S-3 Viking twin-engine jet began in May and are expected to continue in June. Tests of the prototype radio were preceded by a number of flights of the S-3 in which NASA researchers sought to characterize the way radio frequencies behave at the specific bandwidths assigned to civil UAS operations – something that had not been done before. The way radio waves move through the air can be affected by a number of different things, including whether the ground is covered with leafy trees or snow and ice. Mountains, oceans, weather conditions, urban sprawl, skyscrapers and more can cause a change in a radio signal, for a good or bad. These channel characterization flights began last December with the S-3 flying over areas of Ohio and Pennsylvania while a specially outfitted trailer with a 60-foot deployable antenna mast transmitted signals from the ground below. With the prototype radio now in hand, the channel characterization and prototype radio tests will overlap a bit as there are plans for a visit to California this month to record data over coastal feature areas that include the ocean, mountains and desert. NASA's UAS in the NAS Project is part of the Aeronautics Research Mission Directorate's Integrated Systems Research Program. 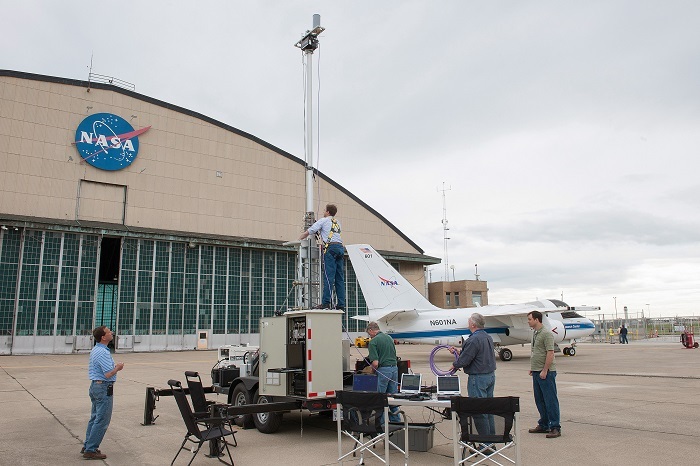 A NASA engineer standing on the trailer assists with raising the communications tower that transmits to the NASA research aircraft.